It would start with some yoga. 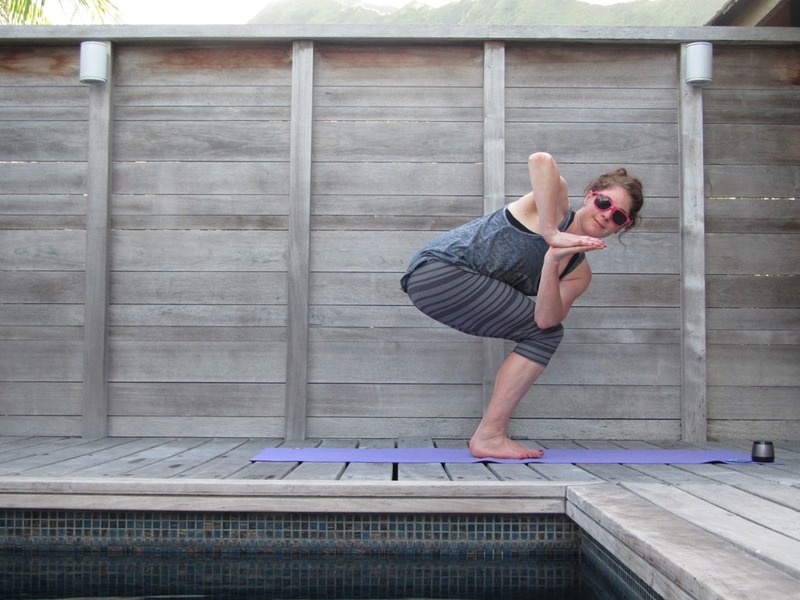 Not tropical paradise yoga as pictured above, but sweaty studio hot yoga. I didn’t sleep so great last night, my monkey mind was running wild, and I struggled to stay focused throughout this morning’s challenging class as well. In the end, I worked hard to stay present but left feeling grounded and empowered. I love starting my day on my mat! I got to go into work a little later than usual and had planned to spend the extra hour enjoying a latte at Starbucks. When I got home, I realized that I also had time to prep tonight’s dinner (meatloaf in my new meatloaf pan), so I would just have to bake it when I got home at night. This meant that I wouldn’t have time to do my hair, so I sacrificed my hair for dinner. I am in desperate need for a cut so I ended up with a ‘crazy hair…don’t care’ situation! I cut a few corners with the meatloaf recipe form SkinnyTaste, but kept it as written below. In case you are short on time, just know that you can use Oregano instead of Marjoram and you don’t NEED to sauté your onions (although it will be a bit different). With dinner ready to go in the fridge, I drove over to Starbucks with my book, brackets, and a gift card. I ordered a ginormo latte while I picked a few teams and then dove into my book. What a fun way to start the day! My work day was fairly typical…you know…just working! However, on my way home I was chatting with my best friend when I changed my mind about parking in the garage. I switched into reverse looked right, looked left, looked right, looked left and BAM! off went my right side mirror. Oopps! I was pretty bummed but what can you do?! Objects in mirror are sadder than they appear. 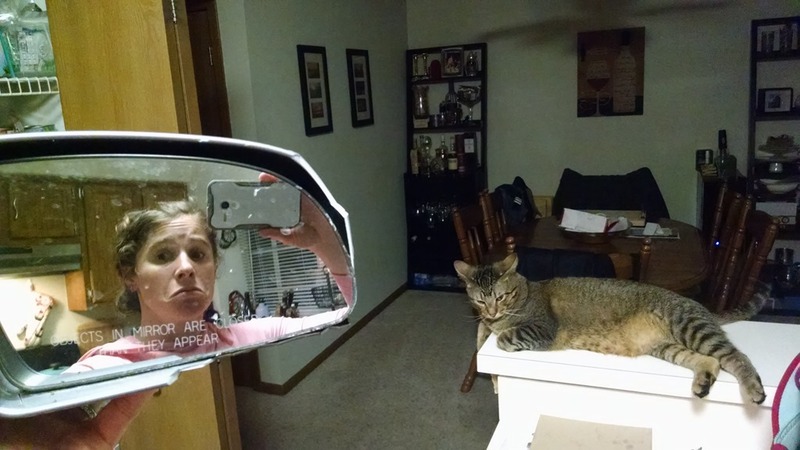 Cooper is just sad because he hadn’t eaten dinner yet : ) I should probably clean my mirror before reattaching it tonight. The BOY arrived home not too much later with a treat to cheer me up. 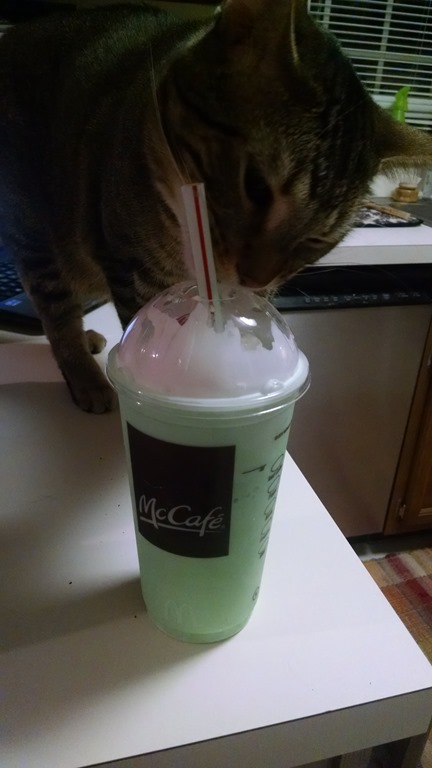 It’s tradition to have at least one Shamrock Shake every March! Meanwhile, I put dinner in the oven with some roasted cauliflower and made another batch of energy bites. Yea, it was just that kind of day! So my meatloaf turned out amazing! Let’s just hope we can say the same for my bracket…ha ha! We ate dinner after our shakes and are currently debating if we should watch the play in basketball games or a movie. My vote is Spy with Melissa McCarthy! Okay, now to end my day, I have to finish my bracket and find some duck tape to reattach my car mirror. And maybe try to relax, just a bit. Sauté olive oil and onion on low until translucent, remove from heat. In a medium bowl mix turkey, onion, breadcrumbs, egg, 1/4 cup ketchup, salt and marjoram. Place mixture into a loaf pan or shape into a loaf and place on a baking pan. Spoon sauce on top. DS took right mirror off about two months ago. Just today it got fixed. DS ordered part online-29.99 and D Step F took it to local HS. who teach studs to be mechanics and they put it on. All free but Donation was made of 20 dollars toward scholarship. Check a local hs to do same. Very exp to replace/ install. Good luck. That sounds like a GOOD day! Any new blogs you are loving? ?